New York, April 1917. "Recruiting address -- 23rd & Broadway (Flatiron Building)." George Grantham Bain Collection glass negative. View full size. Submitted by TimeAndAgainPhoto on Wed, 11/24/2010 - 9:49pm. Below is the same perspective from April of 2010. The buiding has been disarmed. Submitted by Anonymous Tipster on Thu, 03/12/2009 - 10:08am. I worked on the block for 12 years, and the Sprint store has been there as long, at the storefront glass area. You can actually see it in the commercials for Sprint. Submitted by Rnadom Geezer on Sat, 10/25/2008 - 12:46pm. Now H. I. Wagner, Importers. See the fellow who loses his hat in the "at the foot" video, very funny. A wonderful elderly man I once knew had told me that as a young lad coming of age, he and his pals would loiter city streets watching for the provocative flash of a lady's ankles. I would imagine this was 1910 to 1915 or so. The Kelly-Springfield girl of 1910 was the subject of great scrutiny when she blatantly had her ankles exposed in the infamous tire ad of that day. OMG, how things have changed. Submitted by Anonymous Tipster on Fri, 10/03/2008 - 9:53pm. I work in the Flatiron Building now, right outside one of the offices in the point. They're great--the views over Madison Square and down Broadway are something else. But the building is entirely book publishers (except for the ground floor) and with all the windows in the point, there's hardly anywhere to put a bookcase! It's rather frustrating. Oh, and it's still often that windy at the point. Just yesterday I had my skirt blown up to my shoulders (thank goodness I was wearing shorts underneath). The long string of subway grates on the Broadway side exacerbates the issue. Submitted by Anonymous Tipster on Sun, 09/28/2008 - 11:48am. "At the Foot of the Flatiron" (1903). I prefer the one below, "What Happened on 23rd Street" (1901). It's a bit risque at the end. You can see her knees! Submitted by tterrace on Sun, 09/28/2008 - 11:24am. 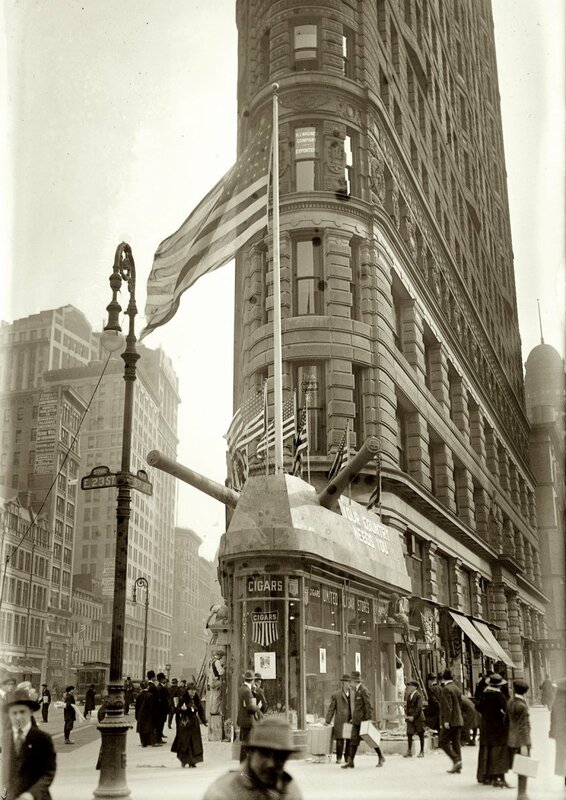 The wind-whipped sidewalk action past the then recently-constructed Flatiron Building was captured in motion by the American Mutoscope and Biograph Company in 1903. The two-minute film shows it all: men grasping their hats, women struggling to control their billowing skirts, idlers hanging around watching, adolescent boys making faces at the camera, the cop on the beat monitoring it all. It's included in a DVD set called "More Treasures from American Film Archives." Submitted by Anonymous Tipster on Sun, 09/28/2008 - 9:54am. Doctor K, it's funny you should mention breezes. 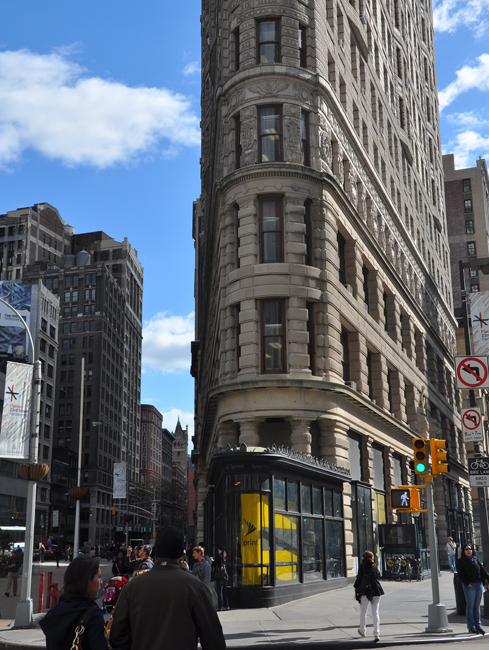 The Flatiron Building's unusual prow shape was noted for causing a windsplit effect, like a ship breaking through waves. Legend has it that men would gather here to watch women's skirts fly up in the gusts. The expression "Twenty-three skidoo" is said to have come from cops basically saying "Beat it, perverts, move on." 23, as in 23rd Street. Submitted by Anonymous Tipster on Sat, 09/27/2008 - 9:37pm. Not a battleship, but a giant snail! Submitted by allie on Sat, 09/27/2008 - 5:34pm. I enjoy how so many in the crowd stop to observe and probably supervise the painters. Everyone had such uncomfortable shoes back then. A question: What is that line (electric?) that runs down from the street light? Submitted by Brent on Sat, 09/27/2008 - 1:19pm. There's a different picture of this store in the Wikipedia article on United Cigar Stores. Apparently the structure atop the store is supposed to represent a fort, probably a coastal defense fortification. Or at least that's what the caption in the Wikipedia article says it is. Given the shape, the layout of the guns and what appears to be "mortar lines" between "blocks of stone" I suspect that's more accurate than calling it a ship. United Cigar Stores Limited was and apparently is still in existence in Canada but I don't believe it's the same company as the American firm shown here, although both were/are chains. There isn't one around here anymore but I remember the stores not particularly specializing in tobacco products. They were as much about knick-knacks and magazines as about tobacco. As a kid I got most of my Matchbox cars from a United Cigar store, and later it was a great place to browse for comics. Submitted by Greetings from Sioux Falls on Sat, 09/27/2008 - 10:18am. The hustle, the bustle, the streetlights. Submitted by DoctorK on Sat, 09/27/2008 - 8:48am. I am from an era when everybody coveted a corner office because you had windows on two sides. I like to imagine what one of the end offices here would be like. It might be small and oddly shaped, but windows on three sides! It probably helped on hot pre air conditioning days too if there was any breeze. Submitted by John Muir on Sat, 09/27/2008 - 7:26am. We're sailing this battleship uptown! Also: don't forget your cigars.